I couldn’t help but notice the proliferation of dude food on social media since the start of the American baseball season a few weeks ago. We won’t be able to enjoy these delicacies at Canberra Cavalry home games until the ABL season resumes later this year. 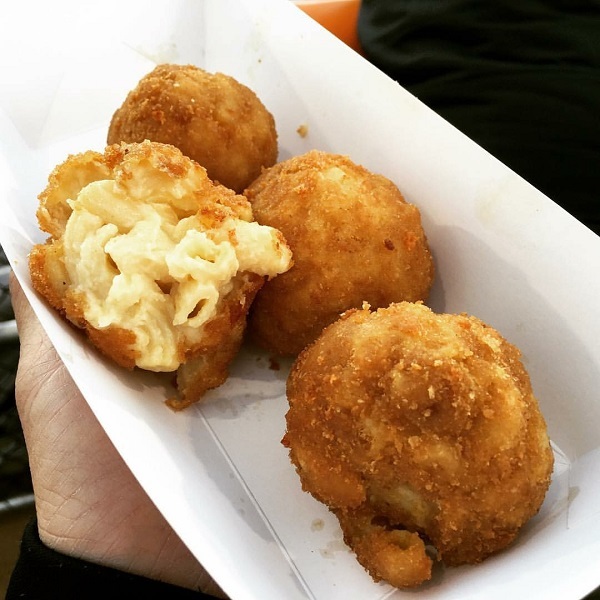 In the meantime, though it got me thinking … Where are Canberra’s best fried macaroni and cheese balls? Having enjoyed this pub food delicacy at the Bentspoke Brewery in Braddon on numerous occasions since it opened in 2014, as well as at Canberra Cavalry baseball games (themselves notorious for delicious pub-style food), I was determined to find some and share my experience on RiotACT, and perhaps even try and make some at home. I also heard that Braddon’s Grease Monkey was also offering them alongside its signature burger fare. But the first stop was Bentspoke, where I knew they did fried pub food well. And I wasn’t disappointed. For $14 I was served four large fried “smoked” mac and cheese balls that were hot, crunchy on the outside and soft and gooey inside, as they should be. It would be a sin to be at Bentspoke and not drink beer so I also ordered a large glass of their signature ale Crankshaft*. 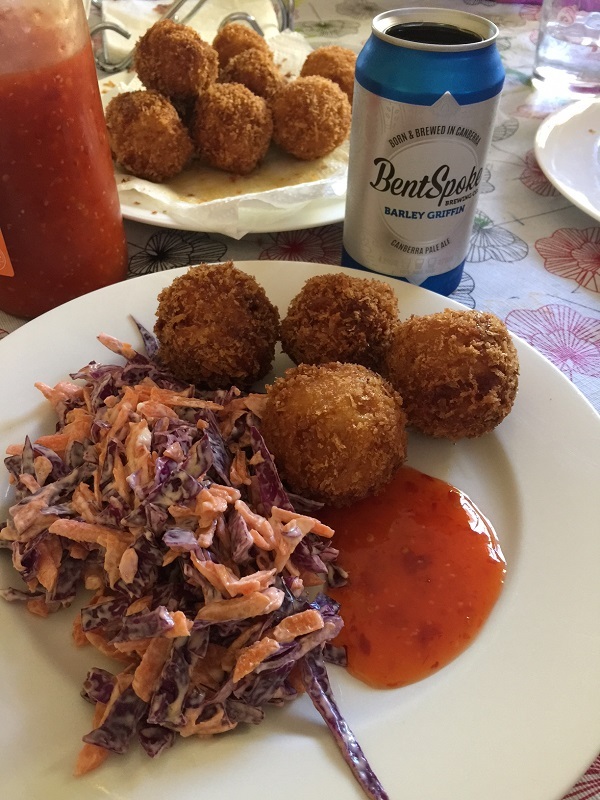 Bentspoke’s crumbed macaroni & cheese balls are also served with roasted corn & chilli salsa, as well as a delicious chilli jam. As luck would have it I had the good fortune of bumping into some old acquaintances at this three-year-old pub, including the owner Richard Watkins, who was so impressed with my enthusiasm for this particular item on his menu that he agreed to share the recipe (see below!). Richard explained that the success of Bentspoke is not based on secret recipes but on good service and a quality product. I couldn’t agree more. 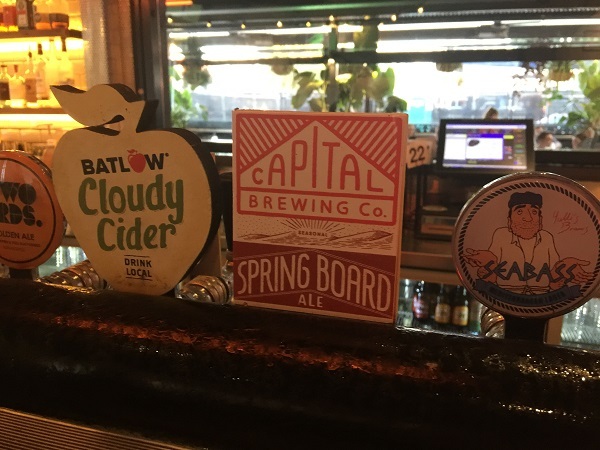 You pay more for beer and food at bentspoke than many other pubs and cafes/restaurants in Canberra, but the quality and service never fails to impress. It’s on my list of “must-see” places for family and friends coming to Canberra, especially if they like beer and pub food. I have to say the Grease Monkey cheese bites were a bit disappointing. I can’t be critical though as I did order two lots (YES I had twelve bites) and found them filling! 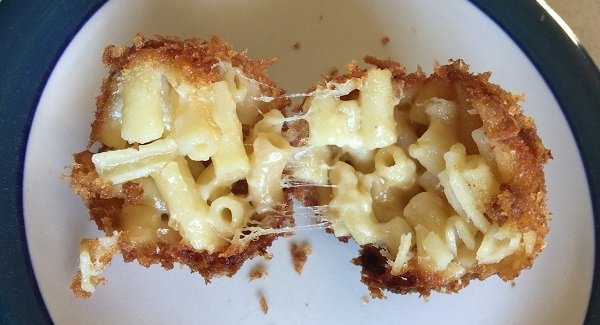 but they lacked the warm soft gooey cheesy centre that makes a great mac and cheese ball. At $1 each they are much cheaper than Bentspoke, but the latter, as they are larger, creamier, smokier, gooey-er, will leave you dreaming about more. Which is why I then tried to make some at home! 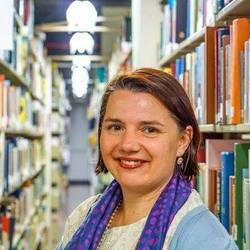 I did some research with Dr Google, and also found a young volunteer. The two most important things you have to know to avoid a mac’n’cheese ball catastrophe is 1) you must refrigerate the mac’n’cheese mixture overnight so that it sets before you even try and make the balls. 2) the balls are best made by hand with the use of a large ice-cream scoop to get a consistent size before they’re frozen for at least a few hours prior to frying. 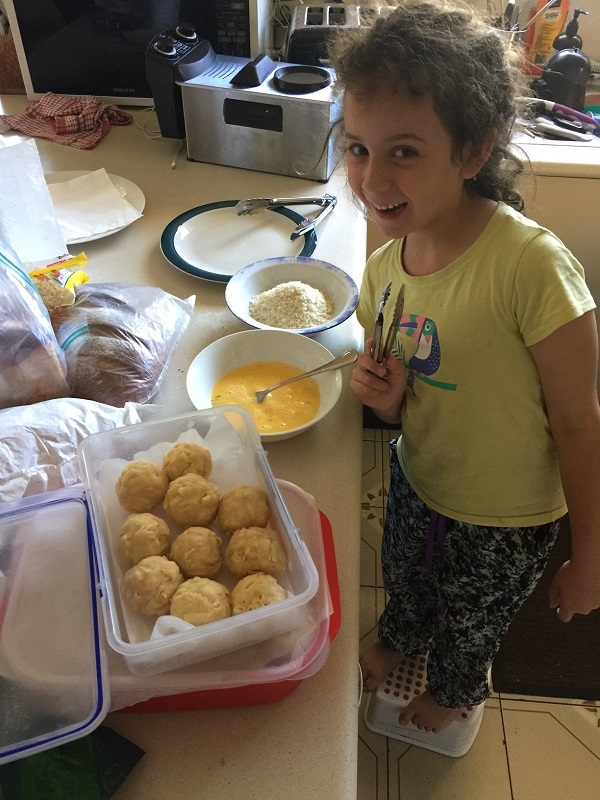 The photo below shows Ms 7 just before she starts dipping frozen balls into an egg/milk mixture and rolls them around in a second bowl to cover them with panko crumbs, after which dad deals with the OH&S issues around boiling oil. Here I am demonstrating a very slow and inefficient frying technique (it took me a while to work out I could fit six at a time in the frying basket … i.e. my dear wife explained after she watched me do it for a few minutes). In terms of time expended, home-made was probably just as expensive as Bentspoke, although the ingredients were cheap, I fluffed around a bit researching and experimenting before I worked out how to do it. They tasted pretty good though – and my better half and the kids seemed to be mildly impressed once lunch was served. Mrs CBRfoodie gets credit for an awesome coleslaw made from red cabbage, carrots, honey mustard and mayonnaise. The Benstpoke mac ‘n’ cheese balls were far superior to what I found at Grease Monkey as well as what I had been able to cook myself at home, albeit on my first attempt. That’s not surprising though, given Richard Watkins and Tracey Margrain have been experienced in pubs and hospitality for many years. Their quality menu reflects their own desire to serve enjoyable food that complements the high-quality beer their nationally recognised brand now represents. 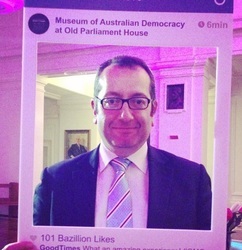 Don’t take my word for it. Try them yourself if you haven’t already, and if fried food isn’t your thing there is plenty of other tasty options to choose from. You can check out the full pub menu here. If you’re wondering what the insides of my mac’n’cheese balls looked like check out the photo at the top of the article! Not bad for a first attempt. In hindsight, I will add more mozzarella cheese and thickened cream, as well as smokey bbq sauce to make them more moist and gooey like the tastier Bentspoke version. While whisking, drizzle in warm milk and cream. Cook sauce for about 10 minutes. Last week our household entered the new millennium and subscribed to Netflix. Now that I know the local bottlo has Bentspoke specials and I can make reasonably good fried food, I think we’re now prepared to watch some Netflix marathons from the comfort of home. At least until the baseball season kicks off, then I’ll be around to Narrabundah quick smart to try more of these at the next Cavalry ABL game: Charge! 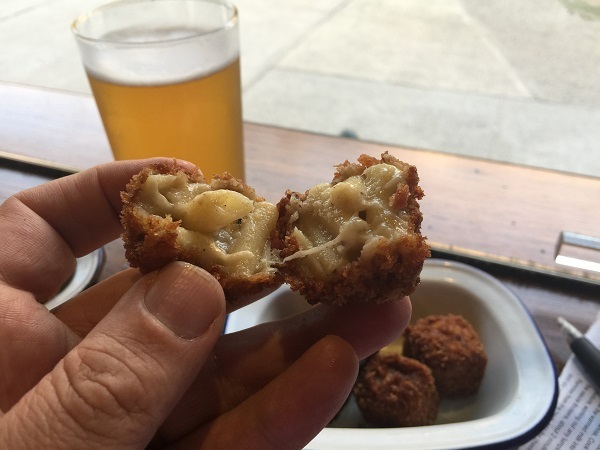 Have you had fried macaroni and cheese balls (or bites) anywhere else in Canberra? How much did they cost and how did they taste? *I have since learnt from a friend that Sprocket (rather than Crankshaft) may be a more appropriate beverage to pair with mac ‘n’ cheese, so I’m planning to return to Bentspoke soon to further investigate this hypothesis. 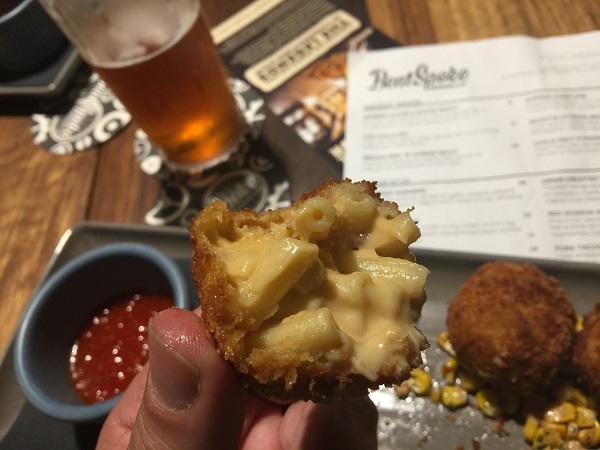 Just heard #Lucky’s @QTHotels #Canberra also does a plate of tasty truffle mac’n’cheese crispy ballsy bites for $14. Have just added it to my list! Thanks Serina! yes, if you left over mac’n’cheese it would be a reasonably frugal meal to make with the leftovers – just add extra cheese before you chill it! Elias these look fab:) I can’t say I have been on the beer/mac & cheese ball circuit, so I can’t comment about where the best is. As a frugalista, however, I will definitely be creating this with leftover mac & cheese, of which I tend to have a lot as it is my four year old’s favourite food. I love Bentspoke’s classy version – looks like a great combination.